ICF Cleveland serves business and personal coaches who are interested in extending their knowledge and personal growth in the field professional coaching. Members learn from one another and support one another in a professional, convivial array of workshops, monthly chapter meetings, social events and other forums. 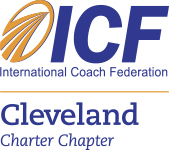 ICF Cleveland's purpose is to further the profession of coaching through community outreach, and educational and networking opportunities for established and aspiring coaches. ICF Cleveland promotes an awareness of coaching throughout the business community in both for profit and not-for-profit sectors. We provide learning opportunities for coaches who are focused on building their practices and growing and enhancing their skills. Our chapter members meet on the second Friday of each month at Indiana Wesleyan University, 4100 Rockside Road, Independence, OH. Networking from 7:45 a.m. to 8:15 a.m., formal program from 8:15 a.m. to 10:00 a.m.
Our Annual Signature Coaching Event! Advancing the awareness and benefits of professional coaching.